Taylor Made Sur-Moor T3C 24 inch mooring buoys are in stock and ready to ship at Boatersland Discount Marine Supplies. 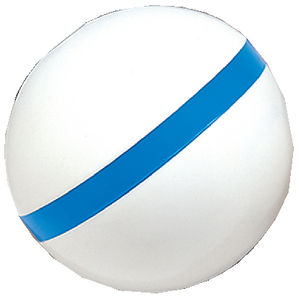 These mooring buoys, part number TAY46374, feature a tube-through-the-center design with blue reflective striping. Made from a polyethylene shell, this hard skin mooring buoy is made to withstand long periods of time in the water and exposure to sunlight. The tube diameter on this 24-inch mooring buoy is 2 ½ inches. The circumference of this model is 75 inches and this buoy is approximately 240 pounds of buoyancy. When purchasing a buoy, you need to know the buoyancy required to support the combined weight of all of the mooring system components. These include pendants and riding chains. Buoyancy provided should be 50 to 100 percent greater than this total weight. Boatersland Marine has Taylor Made Sur-Moor T3C buoys in various sizes and buoyance pounds to fit your needs. Note that the buoys sold do not include the hardware. However, hardware for these buoys can be purchased at Boatersland Marine.